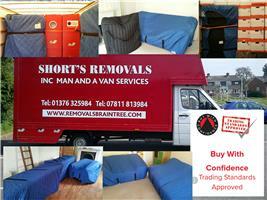 Shorts Removals & Storage - Removals/Storage based in Braintree, Essex. At Shorts Removals and Storage is a family run business since 2012 our aim is to make your moving day as stress free as possible with fully experienced and reliable staff all have been disclosure checked so you know who is in your home. Shorts Removals maintain high standards and are members of Trading Standards Buy with Confidence fully insured Goods in Transit, Public liability and Employers liability. We use professional padded sofa covers and padded mattresses covers also T.V covers and door and floor covers and each item will be individually covered with removal blankets. We also offer a full house or part house packing service, Dismantling and Resembling of furniture. Packing items Boxes, Bubble wrap, Wardrobe boxes, Paper, Tape can be supplied by us. From Braintree to Scotland we can move you and we take pride in every house move.